27 dark red pieces. These will be a brick and basically a â€œbrickâ€� shape. It will work as a brick in most games, or could also be considered a clay. 15 light white counters. These generic white food or cat-tail markers will be great for general token replacement. They will be fatter on the bottom and skinnier on the top than the grain tokens but of a similiar look. 20 grey stone counters. They will have a granite/ dark gray color to them. 27 yellow wheat counters. These will be yellow like bundles and stand up by themselves. 18 orange carrots or food counters. These will look like carrots, orange and just carrot shaped. 36 additional food markers. These will be in 3 varieties, a simple bread, 12 of these. Also 12 Fish tokens (wooden, fish shaped), and 12 chicken leg / drum stick shaped pieces of meat. 12 Gold markers. These trapazoid shaped gold markers are great for all those euro games that require gold of any sort. These will look like a real gold brick in terms of shape and not a lame yellow cube like most games have in them. The total number of pieces then is 33 wood, 27 bricks, 15 white tokens, 20 stone, 27 wheat, 12 gold, 18 carrots and 36 additional food (12 each of bread, fish and drum-sticks/chicken leg). Total of 188 pieces all together. So what can you do with this set? 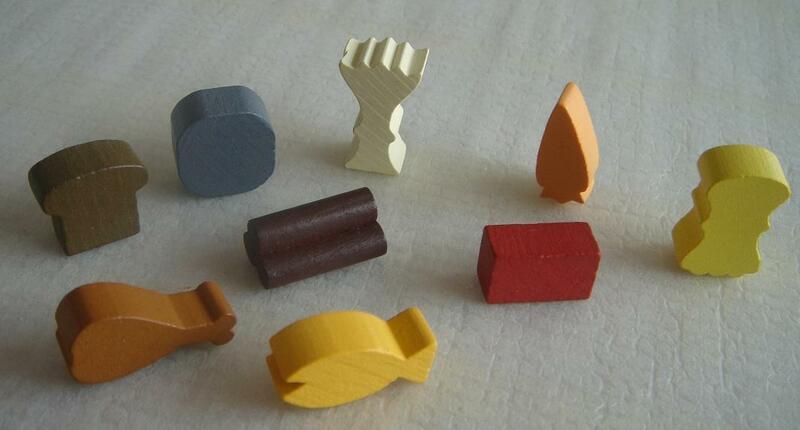 Many kids say they are very very excited to play Farm with them, only with smaller, high-quality wooden components. They will also be a good generic token replacement set, you could use them for Stone Age, Powergird, or just about any other "euro" game. Use the wood to power your Powergrid factories! Use all of the Stone, Gold and Wood for Kingsburg! Use these for Agricola! Try them for any other game! This is really a must have for Agricola. It makes the game much more visually appealing and easier for beginners. In my opinion, this is even more important than the animeeples, but really, you should buy both. I keep all my meeples in a little plastic bin I bought that fits in my Agricola box. Just do yourself the favor and buy this. You will not regret it. Let's be honest...if you're looking at buying the animeeples set you won't need much convincing from me. Agricola's little wooden disks are just plain terrible. It's unbelievable how much life these wooden tokens breathe into the game! I couldn't possibly imagine going back to using disks and cubes. You HAVE to get these! Enjoy! I love the way Mayday brands these replacement pieces... 90% of them are obviously, unequivocally Agricola bent. These pieces really liven up the game. Along with the animeeples, you'll actually feel like you're farming crops and eating food... not farming discs and eating cylinders. Very nicely made set!